In 1852, construction work in Dorchester, MA involved using explosives to break up rock on Meeting House Hill. After the explosion, two broken pieces of an ancient metal vase-like object were recovered from the debris. 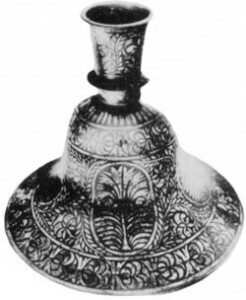 The bell-shaped vessel has been described as being about 4.5 inches high and 6.5 inches wide as the base curving to only 2.5 inches in diameter at the top. The story of this remarkable find ran in the Boston Transcript, a local paper. Later the story was repeated in the Scientific American (Anonymous, “A Relic of a By-Gone Age,” Scientific American, no. 38, June 5, 1852, p.298.). It was inferred from the locations of the two pieces of this silver-colored object (see right) amongst the debris that this vase had been blasted from the solid puddingstone which makes up the Roxbury Conglomerate approximately fifteen feet under the surface at Meeting House Hill. The Roxbury Conglomerate, in which the vase was found, is dated by evolutionists to the Ediacaran Period, between 570 and 593 million years ago. Clearly the Dorchester Vase qualifies as an out-of-place artifact! The story of this curious artifact has been repeated in a number of different forums, including p. 46 of the 1985 Reader’s Digest book Mysteries of the Unexplained. Sometimes the object has been described as a pot or a candlestick holder. Creationists have categorized it as an antediluvian artifact.